Behavioral medicine is a new and still evolving concept in the health care field. As noted elsewhere (Gentry, 1982), the term itself has been used in several distinct ways to highlight teaching, research, and clinical service activities of various groups of behavioral, social, and biomedical scientists and clinicians. The two primary tracks of activities that fall under this rubric essentially have to do with: (a) the application of “behaviorism” to medicine, and (b) an integration of thought and technology between biomedical and behavioral science disciplines. The former represents an outgrowth of Birk’s (1973) initial use of the term in defining the merits of biofeedback in treating medical disorders such as asthma, epilepsy, tension and migraine headaches, and Raynaud’s Disease. The latter reflects a consensus definition emanating from the now historic Yale Conference on Behavioral Medicine (Schwartz & Weiss, 1978b) and subsequently amended at a similar meeting held at the Institute of Medicine, National Academy of Sciences (Schwartz & Weiss, 1978a). 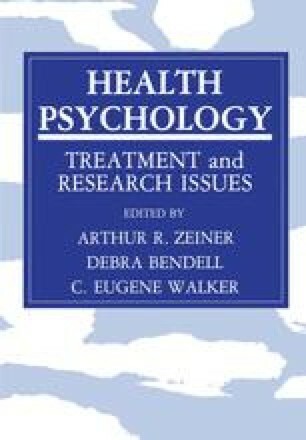 This chapter is based on an address by the first author at a conference entitled “Health Psychology: A Workshop in Behavioral Medicine, Treatment and Research Issues,” University of Oklahoma Health Sciences Center, April 8–9, 1983.